Clashes between Muslims and Buddhists in Myanmar may have subsided, but there is a new crisis brewing in the camps housing Muslim Rohingya. Some readers may find details of this report by the BBC’s Jonah Fisher disturbing. Arriving by boat near Kyein Nyi Pyin camp, there’s no obvious sign that something is wrong. The rickety wooden jetty is busy. A pile of timber has just been offloaded and a procession of Rohingya men is transporting the logs to the camp about 1km inland. The full force of the monsoon rains are due in Rakhine state soon and the wood is being used to build more houses and to strengthen those that have already been built. 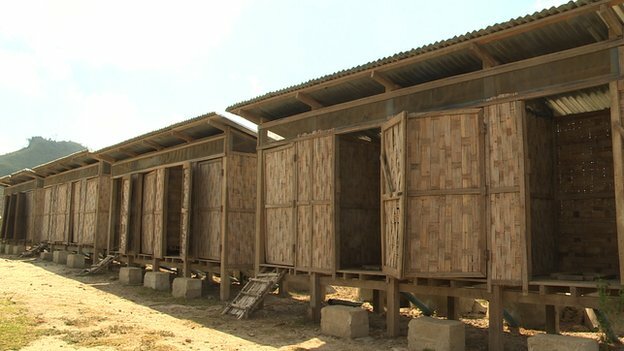 It’s nearly three years since the 4,000 Rohingya Muslims of Kyein Nyi Pyin were driven off their land by gangs of Rakhine Buddhists, and the camp now has a permanent feel. There are corrugated iron roofs, latrines and drainage ditches. Work has even started on a solar powered “Video House” to while away the time. It doesn’t feel like the “concentration camp” some had warned me to expect. There are no fences around the settlement and just a couple of sleepy policemen at the checkpoint on the way in. But the Rohingya are not free to leave. All the surrounding land is occupied by Rakhine Buddhists, many of whom drove the Rohingya from their villages back in 2011. For the last three years life here and in Rakhine’s other Rohingya camps has been one of miserable stagnation. Despite promises from central government, nothing has been done to reconcile divided communities. Large parts of the state are now effectively segregated. Buddhists can go where they want, the Rohingya are confined – “for their own safety”. A new crisis is unfolding in the Rohingya camps, but you have to look inside the dark huts to find it. Pregnant women, sick children, elderly men and women are suffering and sometimes dying because they don’t have access to medicine and basic healthcare. The elders at Kyein Nyi Pyin tell me that in the last month nine people have died there, seven of them young children. None of them had seen a doctor or gone to hospital. The international aid agency MSF-Holland used to provide healthcare at the camp and at many of the Rohingya communities across Rakhine state. Their service was basic but better than nothing. Crucially, if someone was extremely ill and needed to be transferred to Sittwe General Hospital, MSF would try to organise an evacuation by boat. That’s not an option any more. After a sustained campaign by Rakhine Buddhists against anyone seen as helping the Rohingya, the aid operation has been crippled. MSF were asked to leave the state at the end of February and then a month later other international agencies, including the United Nations, were attacked by young men who threw rocks and ransacked offices in Sittwe. With little protection from either the state or central government, the international operation in Rakhine State has had to pull back and is now less than half its strength of three months ago. “They had to leave because of their bias and unilateral actions here,” Than Tun, one of the Rakhine community leaders, told me at his home in Sittwe. Than Tun believes the international community and the Western media have failed to grasp the complexities of Rakhine state. The Rakhine people had been oppressed by the Burmese government for decades, he said, and most Burmese people are indifferent to the threat posed by Muslim expansion into Myanmar. He told us to visit the small Buddhist village of Ohn Yee Pahw just outside Sittwe. This was, he said, a community that should be receiving aid instead of the Rohingya. We found a small village that, in common with most of rural Rakhine, had no electricity or running water. Surrounded by palm trees on an estuary, the few hundred residents of Ohn Yee Pahw are totally dependent on fishing. As some of the fishermen fixed their boats they told me that times were tough. “We don’t go out to sea now, we just stay and fish near here because we are scared of being attacked by Rohingya fishermen in boats,” one of them told me. No-one from the village had actually been attacked, they said, but they’d heard stories of it happening from elsewhere. One of the women told me that as less fish meant less money, most of the families were now unable to send their children to school. Instead of education the village boys seem to be working catching crabs in the estuary. There’s no doubting the lack of investment and poverty of places like Ohn Yee Pahw, but unlike most of the displaced Rohingya the people there can still try to earn a living. And if they are desperately sick there is way to get to hospital. The Burmese government has attempted to fill the gap left by the aid agencies by bringing in doctors from outside Rakhine state to assist, but so far it’s proving woefully inadequate. Aid workers told me the new, small medical teams lack equipment and co-ordination, and some refuse to go to more remote Rohingya communities. There isn’t any spare capacity in the Burmese health service – per capita it’s one of the worst-funded in the world. Tragically even when government healthcare is available, many of the Rohingya refuse to accept it. In Kyein Nyi Pyin, nobody had any confidence in the Ministry of Health teams. For the United Nations and the remaining aid agencies, the deteriorating situation in the Rohingya camps poses a difficult problem. Remain silent and they are complicit, speak out and they risk becoming the next target of Rakhine Buddhist anger. “We know there are many sick people, elderly people and pregnant women who are unable to get the attention that they need, and this is a very serious situation,” Mark Cutts, the head of the UN Office for the Coordination of Humanitarian Affairs in Myanmar, told me. The starting point on the last day of our trip was pictures that a newsagency had taken a couple of weeks previously. 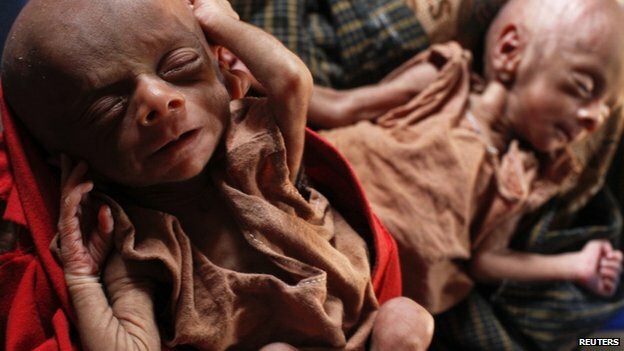 They were of two severely emaciated Rohingya twins, so thin that their skin sagged from their tiny frames. The caption said they were 25 days old and lived with their mother, Norbagoun, in Dar Paing, one of the camps for displaced Rohingya that surround the Rakhine state capital. It’s about half an hour’s drive from the centre of Sittwe to the camp. When we stopped at Dar Paing, a local elder agreed to take us to their house. Norbagoun’s hut was empty and a neighbour poked her head round the doorway. The twins were called Ruksuma and Kulsuma, she said, and just a few days after the pictures were taken the twins had died. Then to compound the tragedy their father had perished too. “Tuberculosis,” we were told with a shrug of the shoulders. It’s a disease that with treatment need not prove fatal. Norbagoun herself was nowhere to be seen.